1. 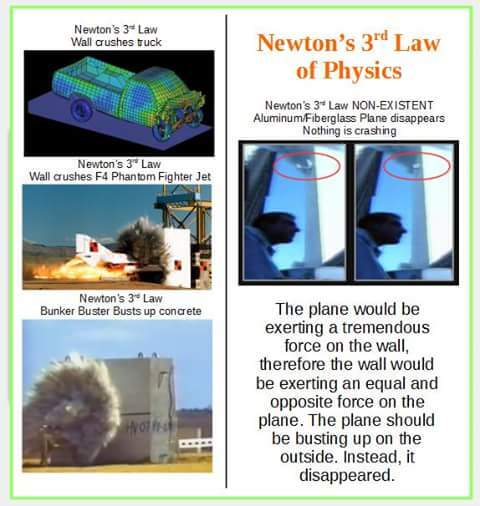 Newton’s Third Law of Motion: “For every action there is an equal and opposite reaction.” An aluminum plane hitting a thick steel beam will have the same effect as steel beam being swung at the same speed and hitting the plane. It makes no difference which one is moving as to the effect on the plane and the beam. In both cases the thick steel beam will do damage to the plane and the beam will emerge relatively undamaged. The faster the speed at the point of impact, the more damage that will be done to the plane. Try punching a steel girder. No matter how fast your hand is traveling, you will not be able to break through it; you will eventually break your hand. It matters not if the girder is swung at your hand or you swing your hand at the girder; assuming the impact is at the same speed, the injury to your hand would be the same. Let’s apply Newton’s Third Law to Flight 175. In the 9/11 story, Flight 175 strikes the South Tower at 450 m.p.h. Now imagine that the South Tower moved at 450 m.p.h. and struck a stationary Flight 175. 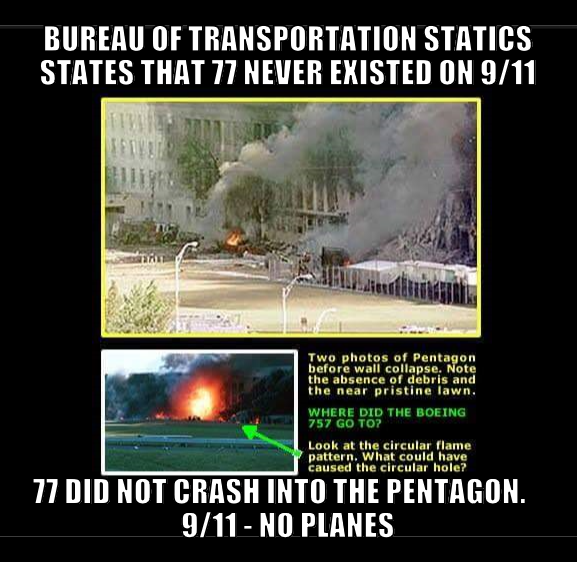 We would not expect that Flight 175 would be undamaged. We would not expect that it would simply disappear into the South Tower. Any video that shows an aluminum airplane with a fibreglass nose cone gliding through a steel and concrete building violates Newton’s Laws of Motion. 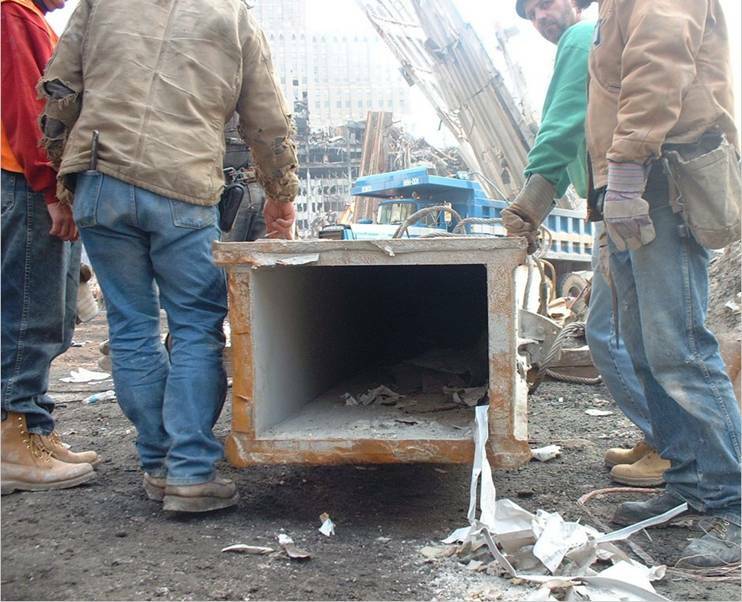 The massive core columns of the World Trade Center were anchored to bedrock. Thirty one of the columns were 36-by-16-inch box shaped columns made of two-inch thick solid steel at the foundation. Sixteen of the columns measured 52 inches by 22 inches triple thick steel boxes that were 5 inches thick at two ends matched perpendicularly with one 6 ½-inch and two 6-inch thick slabs of steel. The box columns reduced in size and thickness at the upper floors, but were still substantial steel columns for which an aircraft of any size would not pose any serious threat. 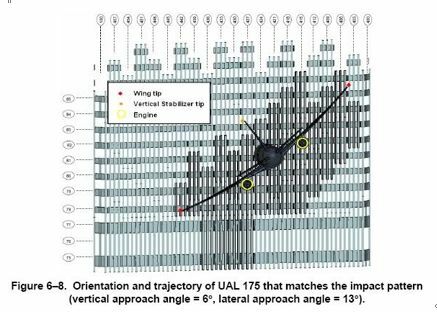 The minimum thickness was 2.25 inches for the columns between the impact zone for the alleged plane that supposedly hit Tower 2 (South Tower) between the 77th and 85th floors. The diagram depicts the dimensions as reported by NIST of one of the 16 larger box columns for the 77th through the 80th floors. 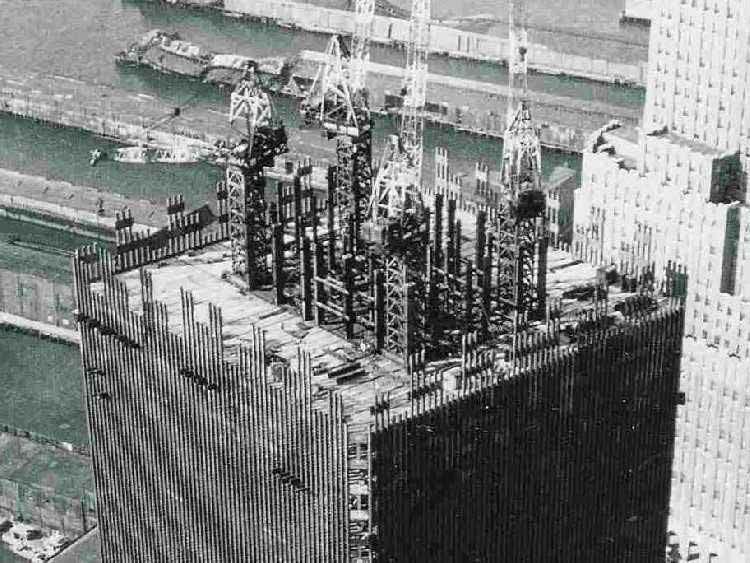 As the core columns progressed to the upper floors, they became smaller in size as seen in the diagram of the columns for WTC floors 80 to 83. 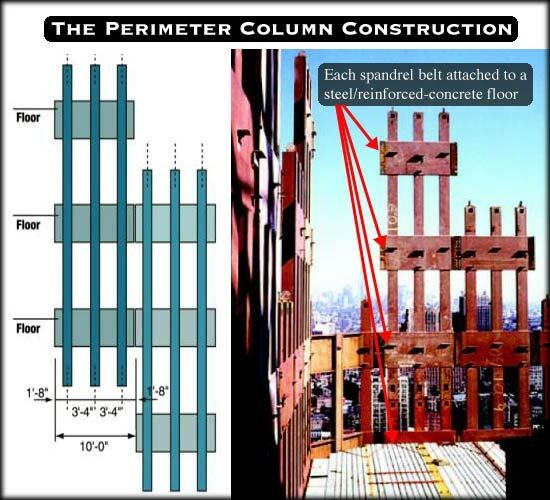 The core columns transitioned to massive I beams that spanned from the 83rd to the 86th floor, as depicted in the diagram of the dimensions of those I beams. 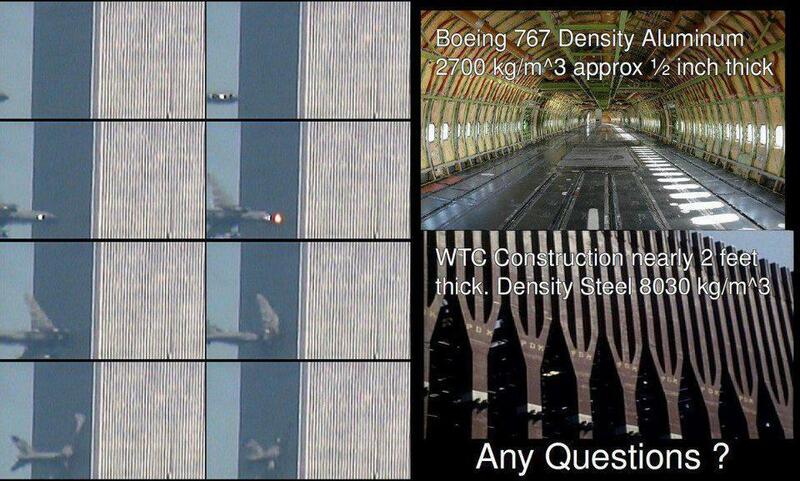 There is no way in this physical world that an aluminum aircraft is capable of breaking such thick columns of steel. 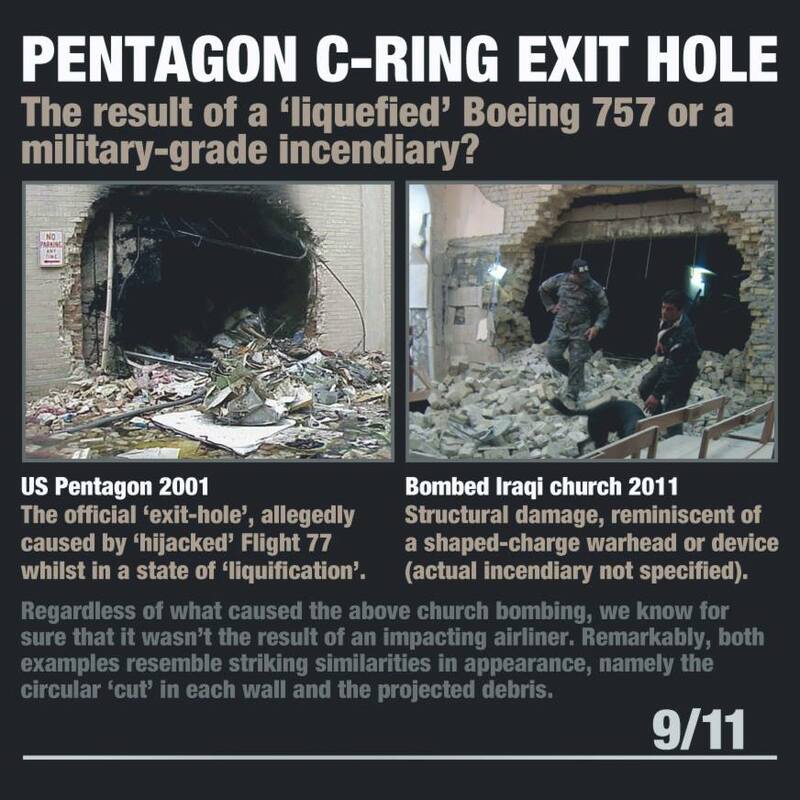 Before the alleged planes even got to the inner core columns they would have had to get past the outer columns. That would be an impossible feat in and of itself. The inner core was interlaced with steel and connected to (59 on each side and one on each corner) outer box columns that were 14 ½ inches by 13 ½ inches on the lower floors with 2 ½-inch thick steel on two sides and 0.875-inch thick steel on the other two sides. The outer box columns tapered to 13 ½- by-14-inch box columns that were 1/4-inch thick at the upper floors. Even though the outer columns did not have the strength of the inner columns they would have been an insurmountable barrier for any plane. They have traditionally used 1/4 inch steel chest plates as impenetrable protection against rifle bullets in bullet proof vests. National Institute of Justice (NIJ) rated Level III body armor 1/4 (.25) inch steel plate protects against all handgun bullets, including .44 magnum rounds, and against rifle bullets 9.6g (148 gr) 7.62x51mm NATO M80 ball bullets at a velocity of 847 m/s ± 9.1 m/s (2780 ft/s ± 30 ft/s). Note in the diagram below how the columns each had two 13.5-inch plates that were 1/4 inch thick steel facing edgewise toward the alleged plane. Those two 13.5-inch steel plates were framed by two other steel plates that were 13 inches wide in the exterior and 14 inches wide in the interior. They were also 1/4 thick. 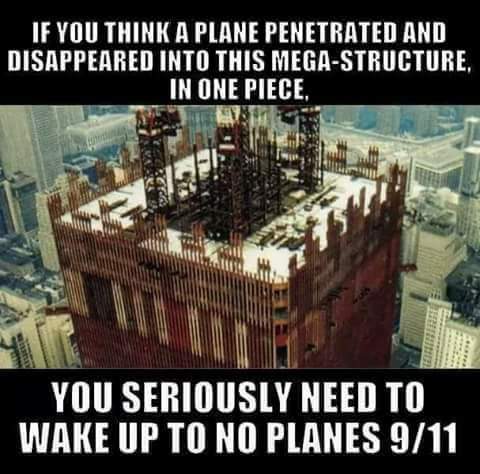 Those columns would have resisted penetration by the plane into the towers and any pieces that made it through the openings between the columns would have been for the most part shredded pieces of the aircraft. Yet there were practically no armor-piercing artillery shells available at the time capable of penetrating such front armor. The Twin Towers’ steel frames consisted of double-walled steel columns that were almost three times as thick as the front armor of a T-34 tank. 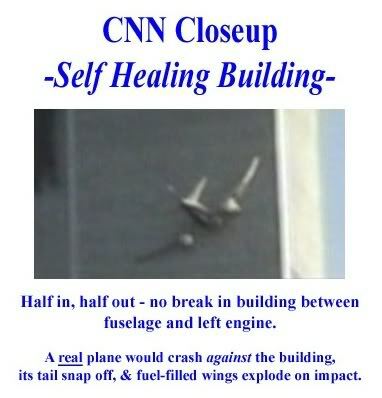 The media and the government would have the public believe that an aluminum plane can pierce into a building ringed with steel columns, and after cutting through those columns, continuing to cut through even thicker columns in the core of the building. 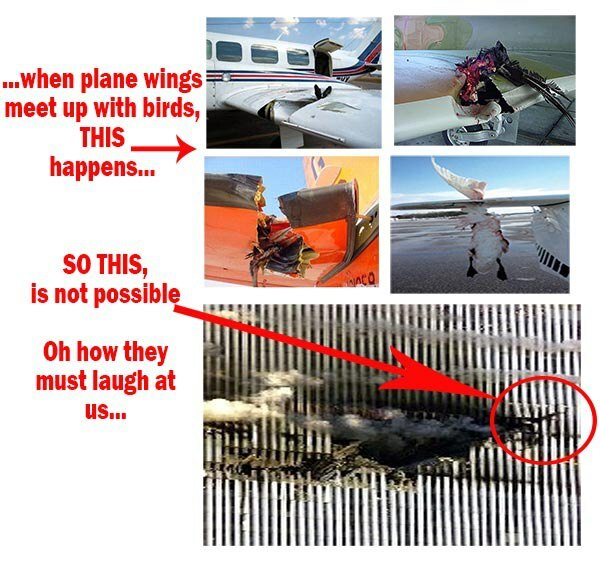 Below are examples of what happens to a plane when it collides with a bird. Birds are light, which is how they are able to fly. 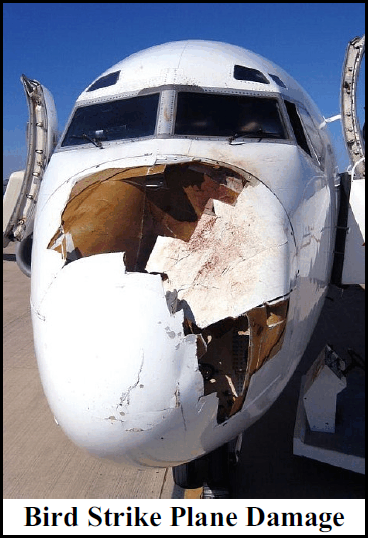 Yet, look at the damage the birds do to an aircraft. 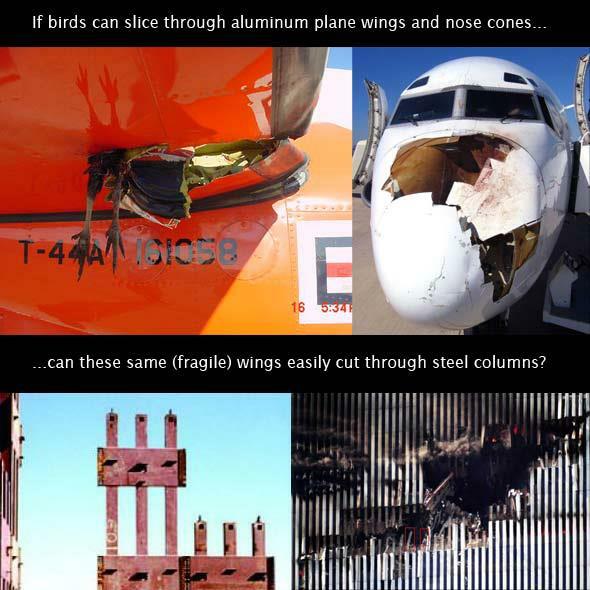 If a bird can do that degree of damage to a plane what chance would a plane have against robust steel columns at the World Trade Center? The alleged planes would have struck floors that contained at minimum 4 inches thick of concrete poured on 22-gauge fluted steel plates interwoven underneath with supporting steel trusses. There is simply no possible way that any part of an aluminum plane, especially not the wings, striking such a building could pierce edgewise through the barrier posed by the concrete floors and supporting fluted steel flooring and trusses. The above diagram shows that Flight 175 was intersecting with eight (8) floors that consisted of steel trusses connected at one end to the core columns and to the external support columns at the other, where each floor was covered with 4-8” of concrete, representing an acre of concrete apiece and posing enormous horizontal resistance to any airplane’s penetration into the building. In the impact videos, notably the Hezarkhani, Luc Courchesne, Spiegel TV and Evan Fairbanks videos we see what we are told is a plane cartoonishly pass through the steel face of the tower like a ghost. As the alleged plane makes contact with the tower there is no bending, buckling or breaking of the plane. No wings breaking or other parts of the plane breaking apart. This is impossible. It is cartoon physics. It melts into the side of the tower like a knife through butter. 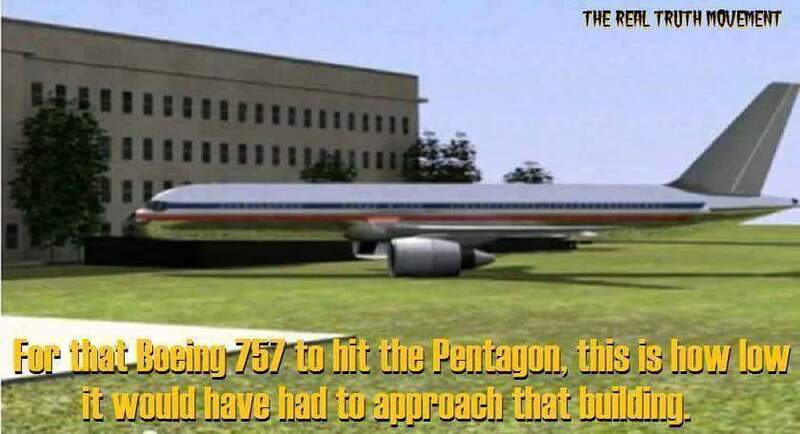 The “plane” we are told is Flight 175 is depicted as being simultaneously both half in the South Tower and still completely intact, a pair of buildings made with 200,000 tons of steel each. 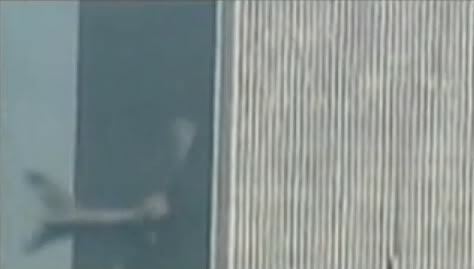 When the tip of the plane’s fuselage hits the steel exterior of the South Tower the fuselage should be breaking up. That would cause the wings to break off. The test is simple. Taking a section of wing from a scrapped 767, attach it to a rocket sled. Reseal the fuel tank and fill it with fuel, and at the other end of the track, fabricate some box-columns built to the specifications of the World Trade Center and collide them together at 550 MPH, filming the results with high-speed cameras. 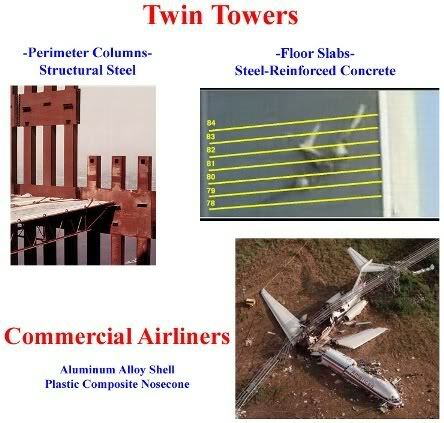 The intent is to copy the experiment used in the Mythbusters: Revolution video by simply replacing the “plow” with a section of wing from a 767, and by replacing the car with steel box-columns built to the same specifications as the WTC. If it is true that a whole plane can slice-through a steel building, a wing-section should slice through the steel columns with ease. The wings would break off immediately upon contact and the plane would explode. It would not enter the tower and then explode. The plane would simply be obliterated to pieces by the steel box columns and steel and concrete floor trusses before it got anywhere near the inside of the tower. Newton’s First Law of Motion: “A body remains at rest or in motion with a constant velocity unless acted upon by an external force.” The plane did not slow down as it made contact with the tower. How can the plane fly at the same speed through the steel/concrete face of the tower as it did through the air? This is impossible. 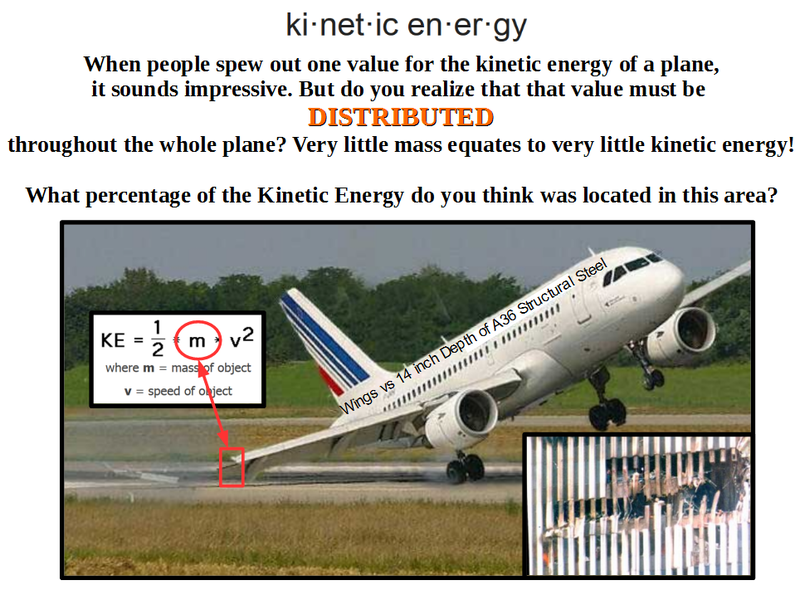 The “plane” also violates Newton’s First Law. 2. 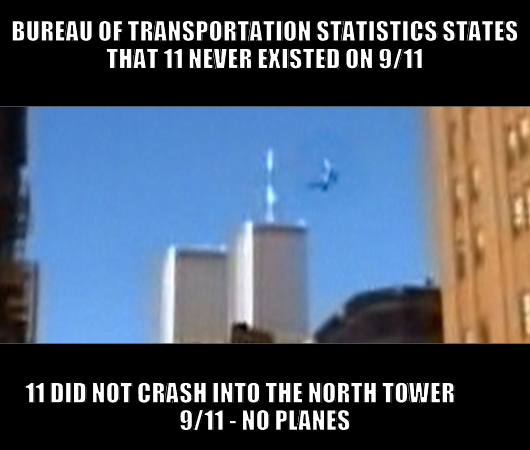 We’re supposed to believe that both planes were entirely inside the towers, with no pieces showing. A Boeing 767 is 156 feet wide and 159 feet long. 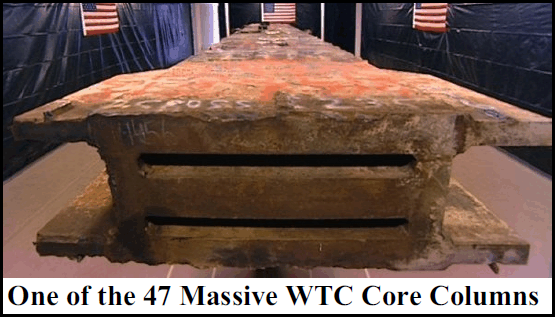 The distance from: the outer perimeter of the North Tower at the alleged point of contact by AA Flight 11, to: the central 47 massive inner core beams that are cross-braced is 60 feet. 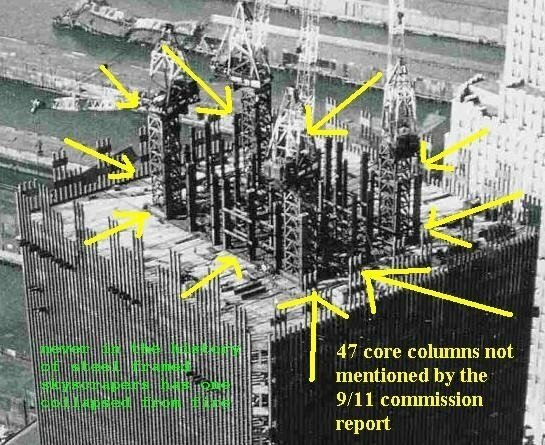 The distance from: the outer surface of the South Tower at the alleged point of contact by UA Flight 175, to: the core structure of that building was 37 feet. The differential in length in relation to the North Tower with respect to plane length and a building length that is measured in terms of the distance to the core structure is about 99 feet. The differential length for the South Tower is approximately 122 feet. A 767 is 159 feet long so most of the plane has got to be outside of the tower in both cases since there is simply no room for the entire length of the plane to crumple into. Why didn’t we see 99 feet of AA Flight 11 sticking out of the North Tower or broken off, crumpled up, and/or crumbling to the ground below? Why didn’t we see 122 feet of UA Flight 175 sticking out of the South Tower or crumpled up, and/or crumbling to the WTC plaza below? 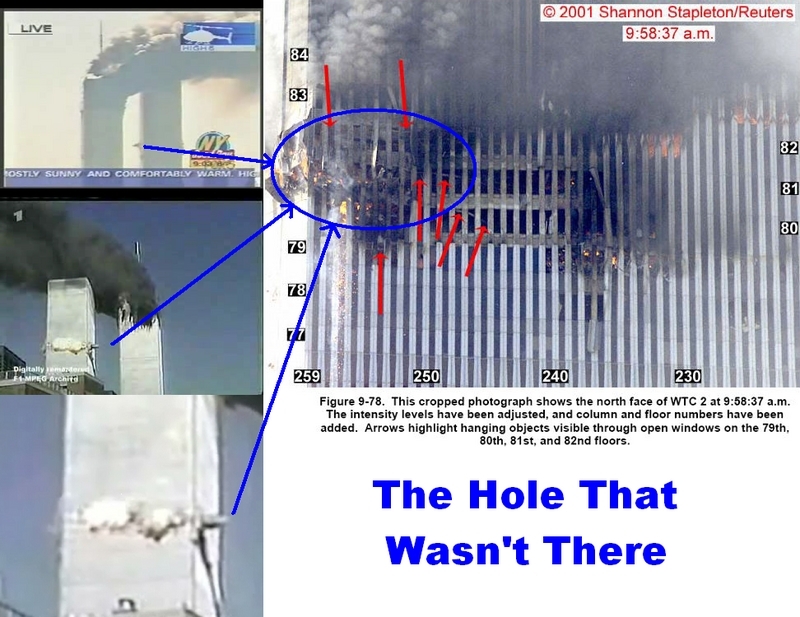 There is no plane or plane wreckage at all to be seen in the hole of either tower in any video or photos. http://www.youtube.com/watch?v=D55l4afJeMc Of course, there are no planes to be seen in the holes of either tower or on the street below because there were no real planes. 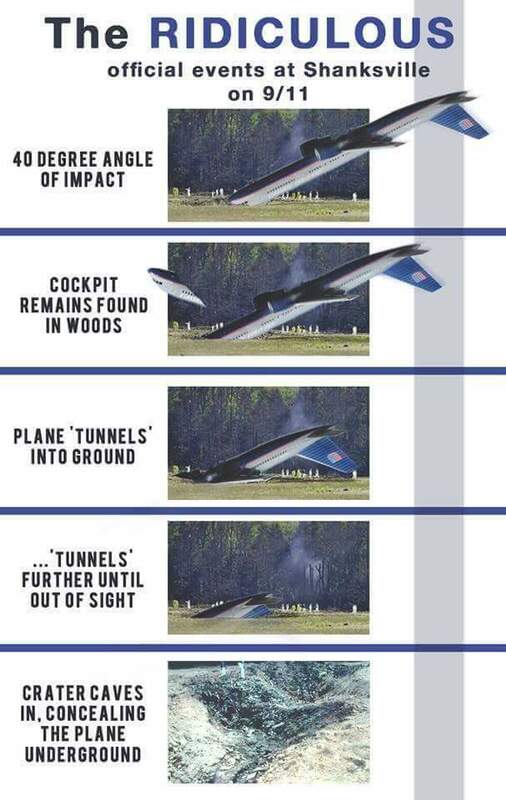 We would expect a sharp deceleration as the plane crumpled to fit into the 60 feet of space (North Tower, Flight 11) and 35 feet of space (South Tower, Flight 175) from the perimeter to the central steel core. Instead, in the videos, both planes enter the towers entirely at uniform motion. A Boeing 767 is 156 feet wide. The width of the hole in the South Tower was 106 feet wide and the width of the hole in the North Tower was 125 feet wide. 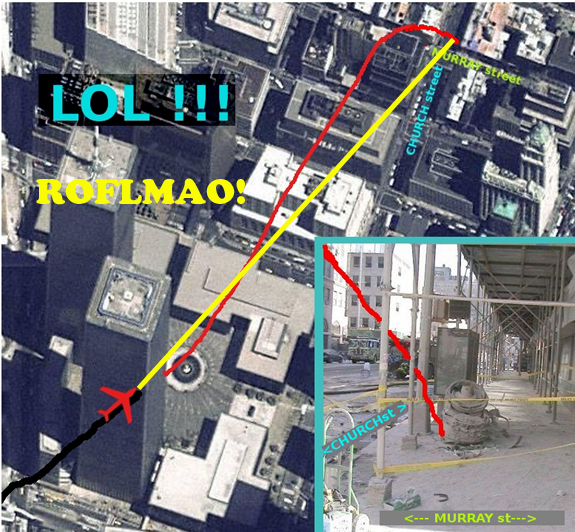 50 feet of the Boeing 767 that allegedly struck the South Tower cannot fit into the size of the hole that is in the North Tower…a hole that was supposedly created by a Boeing 767 with a wingspan of 156 feet. 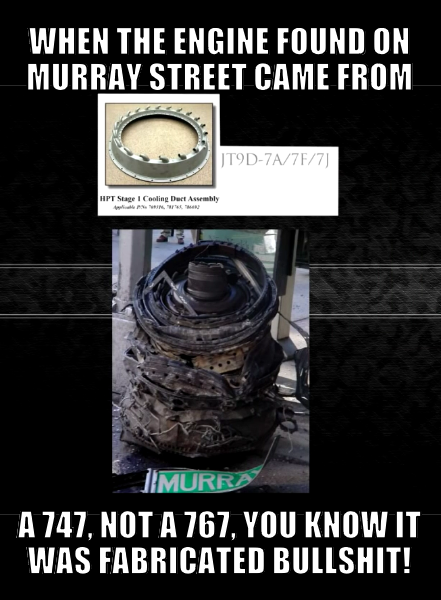 31 feet of the Boeing 767 that is said to have hit the North Tower cannot fit into the size of the hole that is in the North Tower…a hole that was supposedly created by a Boeing 767 with a wingspan of 156 feet. Some people may say that the wings of the Boeings merely folded back as the aluminum portion of the wings came in contact with the exterior steel columns. However we can see this is not what happens in the videos. Even so the aluminum wings would not neatly fold back they would be torn off. WTC South Tower to Plane: So You Think You Can Take Me? At 1000ft the air is too dense, we need to examine the reasons why this is the case. The turbofan engines would struggle to handle the volume of air going into it. Structural loads and pressures on the air-frame are not equal, some parts of the plane can’t handle the stresses as some of the others. The rule of thumb is to go with the lowest known pressure statistics (Boeing have conducted endless tests with this) and use that to calculate the maximum speeds for 1000 ft and again do not exceed 360 knots, in many cases this is not wise to even attempt this speed. Now that does not mean the aircraft can’t exceed such speeds, but Boeing and the FAA utilize VMO Velocity Max Operating and VNE which is Velocity Not to Exceed, to do so is inviting structural failures in which will in high probability result in an airplane crash. Professional pilots and aviation experts will tell you that anyone exceeding 360 knots especially at 1000ft, will run the risk of the destroying the aircraft. The common reason for this is due to the air resistance increasing as you descend to ground level i.e air molecules/pressure begin to increase at below 10,000ft, that pressure is sure to increase even more at 1000ft, which is were all the so called planes of 9/11 were exceeding such speeds. The issue here is can a Boeing 757 and 767, the planes on 9/11, exceed VMO or VNE speeds? and also do the impossible speeds of over 500mph at 1000ft? In 2014 Pilots for 9/11 Truth decided to address the issue of 9/11 plane speeds and why such speeds are impossible, in some cases depending on what sources you want to believe, Flight 77, 93 & 175 exceeded 100 knots above VMO or VNE. See their conclusions here in this 45 minute documentary and see why people who defend this belief are so totally wrong and misleading you all. If you don’t trust that source, then visit the website of WestWind Airlines and download “Flying The Boeing 757-200“. The climb speed to 10,000 is 250KIAS Knots Indicated Air Speed and you are not to exceed it. Descent speed again not to exceed 250KIAS. So how does a 757-200 on 9/11 exceed 400knots at 1000ft? It can’t because it’s impossible. Especially in a horizontal flight. 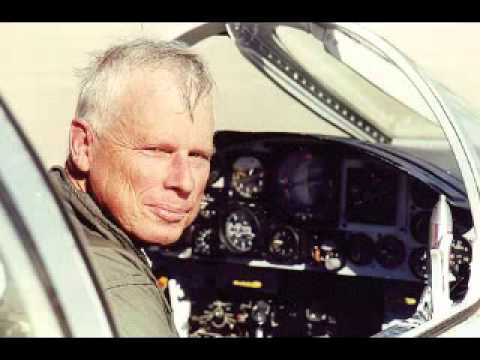 John Lear, one of America’s most distinguished pilots, has written an affidavit about the impossible speed of the plane in the videos and has observed that the absence of strobe lights on the top and bottom of the fuselage indicates we are viewing a fake plane. Capt. Russ Wittenberg is a former U.S. Air Force fighter pilot with over 100 combat missions. Retired commercial pilot. Flew for Pan Am and United Airlines for 35 years. Aircraft flown: Boeing 707, 720, 727, 737, 747, 757, 767, and 777. 30,000+ total hours flown. Capt. 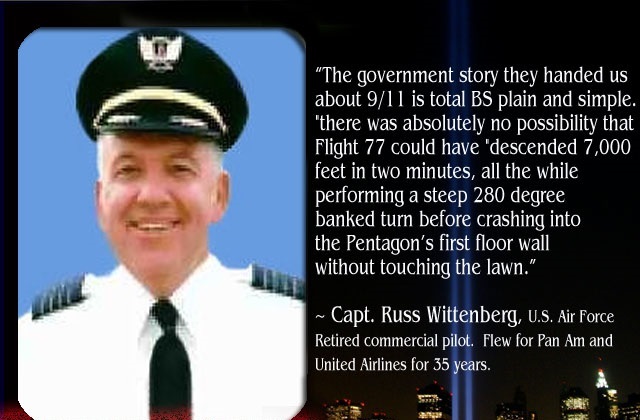 Russ Wittenberg is a unique individual in that he had previously flown the actual two United Airlines aircraft Flight 93 and Flight 175. “I flew the two actual aircraft which were involved in 9/11; the Fight number 175 and Flight 93, the 757 that allegedly went down in Shanksville and Flight 175 is the aircraft that’s alleged to have hit the South Tower. I don’t believe it’s possible for, like I said, for a terrorist, a so-called terrorist to train on a [Cessna] 172, then jump in a cockpit of a 757-767 class cockpit, and vertical navigate the aircraft, lateral navigate the aircraft, and fly the airplane at speeds exceeding it’s design limit speed by well over 100 knots, make high-speed high-banked turns, exceeding — pulling probably 5, 6, 7 G’s. It is said that Flight 175 descended 20,000+ft at speeds in excess of 500mph then levelled off at about 800-1000ft then struck the South Tower. Here is evidence that shows the amazing descent of Flight 175 was impossible. The Flutter Test is a test that the Airbus company had to run in order for their famous A380 to become flight worthy. This test involves taking the plane to 38,000ft, pointing the nose at the earth and reaching maximum speeds and beyond to test the vibration stresses of the aircraft. They level the plane off just before 22,000ft or there about. Because if they continue to descend below that level, the thickness of the air will tear the plane apart or cause the engines to overload. This test is extremely dangerous and requires safety gear, parachute and water survival suits in case the plane has to be bailed out of. 4. There are NO verified airplane parts. Apart from one or two props placed there like a bit of tire and a bit of engine…parts that didn’t even match a Boeing 767 there were no plane parts or debris to be seen and no black boxes were ever found at ground zero. 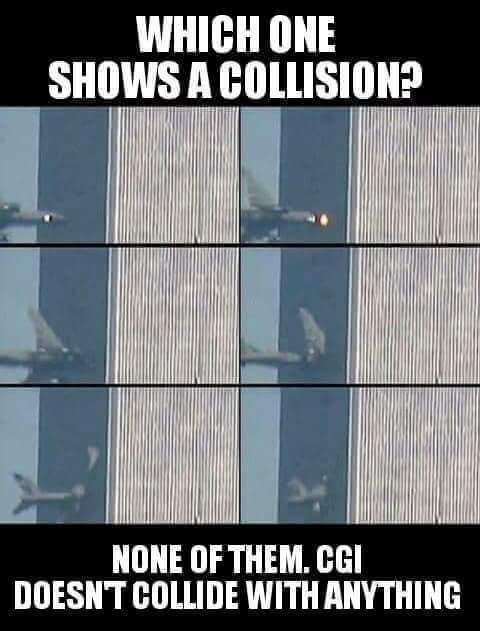 In reality, if a plane had hit the tower it would have crushed up like a car hitting a wall and its wings would have broken off and the majority of the plane would have fallen to the street below. The street below would have been littered with plane debris and the charred remains of the passengers yet it wasn’t because there was no plane. Part of the Federal Aviation Administration’s job during investigating airplane crashes is to gather up all the plane parts they can find and take them to a secure location. These parts are then laid out in their relevant places, on a grid lined floor and checked for identifiable numbers. These are cross referenced by the plane’s history, manufacturer and factory paperwork. This is how planes are identified. Potentially there can be as many as 500,000 to 1,000,000 recognisable parts per plane. Even if I half the lower number i.e 250,000 and times that by the number of planes (4), that gives me a potential one million parts to find. Yet for 9/11: the FAA, NTSB, NIST, 9/11 commission, FBI, CIA or US Government failed to even provide one of these numbers. NOT A SINGLE REFERENCE NUMBER. Now compare this to the Columbia shuttle disaster 2003. This was a space shuttle that broke apart during re-entry through the earth’s atmosphere. The speed of this shuttle was something like 17,500-20,000mph (35-40 times faster than 9/11 planes) and reaching temperatures of 3,000’C. 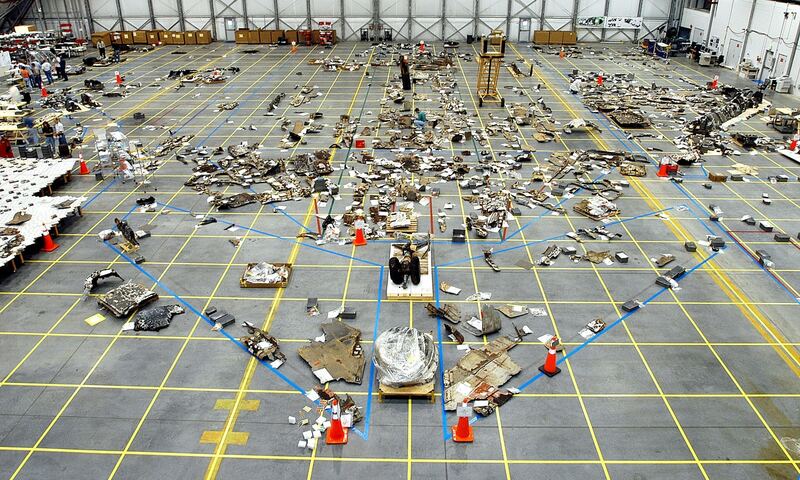 Recovered debris from the Columbia space shuttle. The shuttle broke apart and debris came crashing to earth, despite all that pressure, speed, temperature and impact, 84,000 pieces of debris were recovered. Along with pieces of the shuttle and bits of equipment, searchers also found human body parts, including arms, feet, a torso, a skull, and a heart. Trans World Airlines Flight 800 was a Boeing 747-100 that exploded and crashed into the Atlantic Ocean near East Moriches, New York, on July 17, 1996. Almost 2/3 of the plane was recovered and reconstructed. For three months, workers supervised by the National Transportation Safety Board and the Federal Bureau of Investigation meticulously pieced together some 700 chunks of wreckage from the shattered Boeing 747’s midsection. 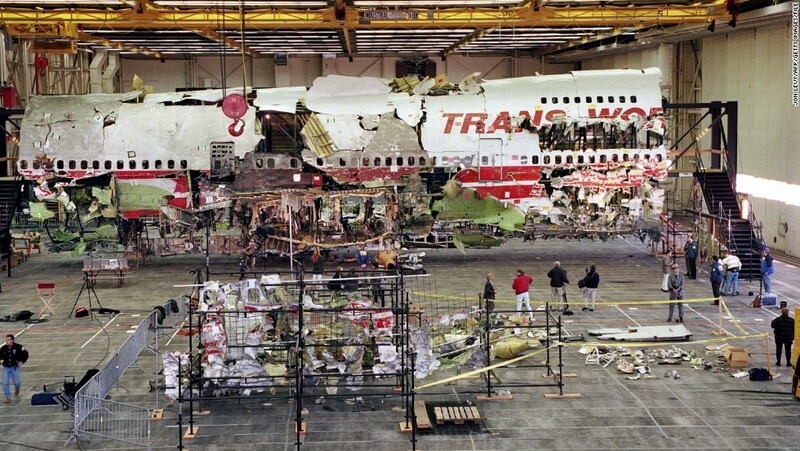 Wreckage of the front portion of the TWA flight 800 Boeing 747 aircraft is displayed in its reconstructed state 19 November 1997 in Calverton, Long Island, NY. 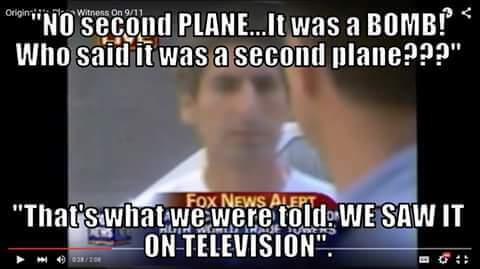 Yet on 9/11 not one single piece was identified. No large significant wreckage at all i.e wings, engines, landing gear, tail section, wheel etc. The reason? 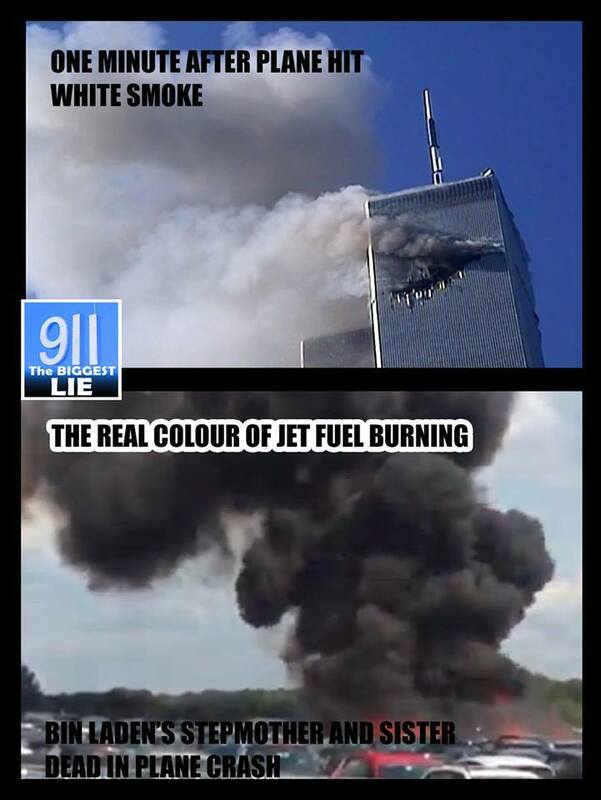 There were no real planes on 9/11. 5. FAA Regulation 121 requires a comprehensive investigation of all crashes of scheduled commercial flights yet there are no official crash reports on the 4 incidents because there were no planes. Source: Michael Hezarkhani (CNN). In between the fuselage and left engine the “plane” has pierced the building yet has not yet made the hole. Source: Luc Courchesne. Left wing missing. 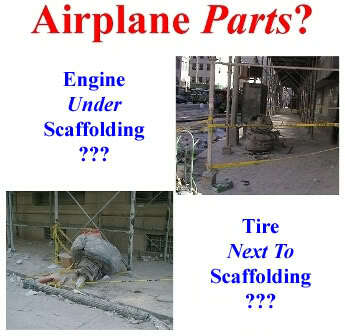 The “plane” has entered the WTC…and the fuselage has not made any hole! It does not look like a real plane. Source: Luc Courchesne. Does this seriously look like a real plane to you? Source: PAX TV. That is not a real plane. Source: Jennifer Spell. The “plane” is almost all the way in and still no hole in the tower! Source: Spiegel TV. Does this look real to you? Source: Spiegel TV. 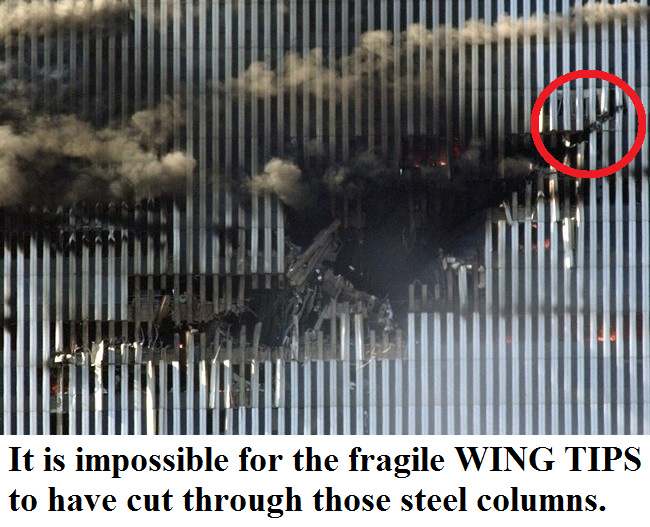 Almost the entire fuselage, wings, and engines have pierced the North Tower, yet not a single sign of an entry hole! Below is a still from the Michael Hezarkhani video showing a digital composite plane on the top and the original “plane” from the Hezarkhani video underneath. The digital composite plane looks more realistic but it still looks computer generated. 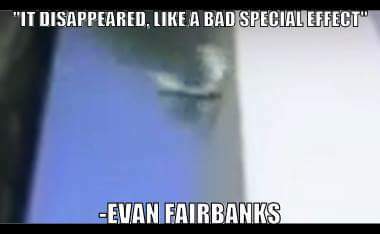 Below is a digital composite of plane on the left compared to the Evan Fairbanks video purporting to show Flight 175 entering the South Tower. Wake vortex created by a plane flying through smoke. 9. Witnesses exist who saw the South Tower explode but never saw a plane. Surrounded by tall buildings very few people in New York’s business district actually had a decent view of the South Tower of the WTC. Only a few thousand people at most would have been able to see the South Tower explode. Few people reported hearing and seeing planes. Most testimonies of those who did are inconsistent with that of a wide-body commercial airliner hitting a building at 800 feet altitude, full throttle. Meanwhile, it was a simple matter for the TV networks to keep the eyewitnesses who didn’t see a plane off the air. A very small percentage of the approximately 500 First Responders at the WTC reported seeing commercial airliners. An even smaller number reported hearing them. There was no audio of ‘Flight 175′ striking the South Tower. This is true even though there were about a dozen videos of the event said to be obtained from lucky amateurs. A jet plane takeoff at 300 feet altitude is 10 times louder than a rock concert. It is a myth and media propaganda that thousands of people actually saw the plane. Many in the vicinity heard an explosion and then were told by the controlled media it was a plane. Very few people in New York’s business district actually had a decent view of the South Tower of the WTC. Only a few thousand people at most would have been able to see the South Tower explode. There are witnesses who saw the South Tower explode but did not see a plane strike the tower. An eye-witness saw the 1st explosion, but no plane. ABC’s Dan Dahler saw 2nd explosion, but no plane. The words “plane, jet, airplane, aircraft” were found in 426 accounts, 1770 times. The final account Sample Size was used for the “Witnesses to a plane” study was 291. A few of those who simply described seeing the impacts on TV were left out, but some were included – the main focus of the study was on those who were close to where the 2nd impact happened. 16 witnesses reported seeing the 1st plane before impact and 16 witnesses reported hearing the 1st plane before impact but only 1 witness reported clearly seeing and hearing plane 1 before impact. I managed to establish that at least 96 witnesses were near the WTC (with ½ a mile) at the time of the 2nd impact and a further 21 witnesses were inside one of the WTC buildings at the time of the 2nd impact. 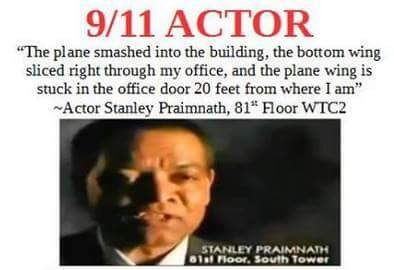 This gave a total of 117 witnesses who were near or inside the WTC buildings at the time of the 2nd impact. Only 19 of the witnesses near the WTC reported actually seeing plane 2 before impact and, as a percentage of total number near the WTC, this was 20%. Only 20 of the witnesses near the WTC reported actually hearing plane 2 before impact and as a percentage of total number near the WTC, this was 21%. Only 8 of the witnesses near the WTC reported actually seeing and hearing plane 2 before impact and as a percentage of total number near the WTC, this was 8.3%. 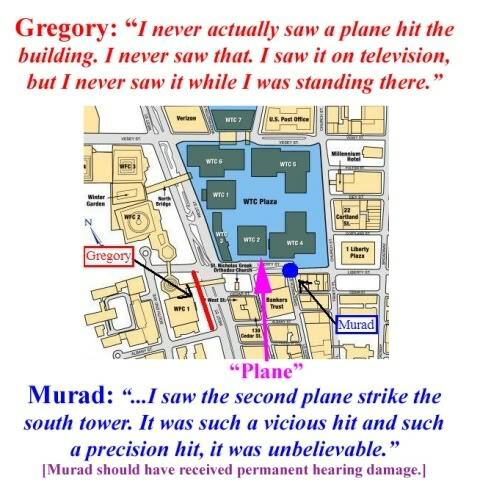 Of those witnesses inside one of the WTC buildings at the time of the 2nd impact, only 2 reported hearing the plane (none saw it). As a percentage of the total of those inside WTC, this was 9.5%. 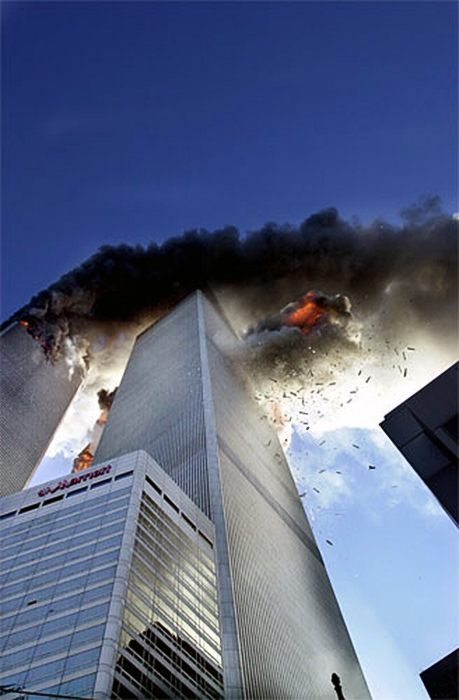 There were 117 witnesses inside or near the WTC and 291 witnesses in the total sample I used. The percentages given below, then, are therefore based on the number 291 – 117 giving a total of 174. 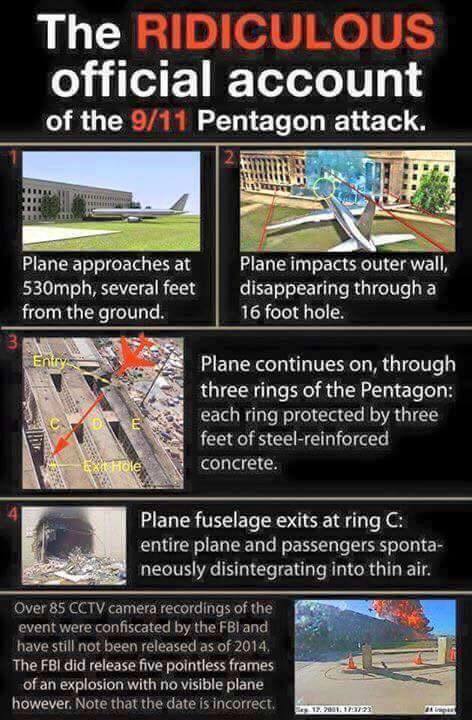 There were 33 witnesses who were further than ½ mile from the WTC Complex and reported seeing plane 2 before impact. As a percentage of the total of those who were further than ½ mile from WTC Complex, this was 19%. DON DAHLER reporting: I’m about four or five blocks just north of the World Trade Center. And at about 10–I would say 10 minutes ago, 15 minutes ago, there was a loud sound that I can only describe it–it sounded like a missile, not an airplane. Then there was a loud explosion and immediately lots of screaming out on the streets. And I don’t want to cause any speculation, but that’s the only way I could describe the sound. And it was definitely not the sound of a prop plane or anything like that. DAHLER: Well, I have flown. I do not have a pilot’s license, but I–I grew up on military bases. and I know the sounds of jets. And–and I’ve been in war zones and–and heard those kinds of different sounds. So, again, not to cause any kind of undue speculation but the sound itself was not of a prop plane. It was perhaps a jet. But it could have been a missile as well. GIBSON: Can you give me–was it–was it a whining sound, Don, or what? DAHLER: Yes. It was–it was a–how to describe it. It was a high pitch, but it had a–a–a whooshing sound. Not–not like a prop plane. A comparison of the “Flight 11” and “Flight 175” videos with the sound of a cruise missile. The sound of a cruise missile is very similar to what is heard in the 9/11 “plane” videos. The explosion is also very similar. 11. What about the 4 flights – and the passengers on those flights? According to BTS statistics, both Flight 11 and 77 officially never took-off on 9/11. The meticulous data kept on every airliner taking-off at every airport in the country also showed no elapsed run-way time, wheels-off time and taxi-out time, not to mention several other categories left blank on 9/11 concerning the two flights. Although flights 11 and 77 have the above data meticulously logged on 9/10, it was suspiciously absent on 9/11, even when every other plane that took of that day had been recorded and logged by the BTS. The flight that was labelled flight 11 by air traffic control was 10 miles from Manhattan at 8:46am. 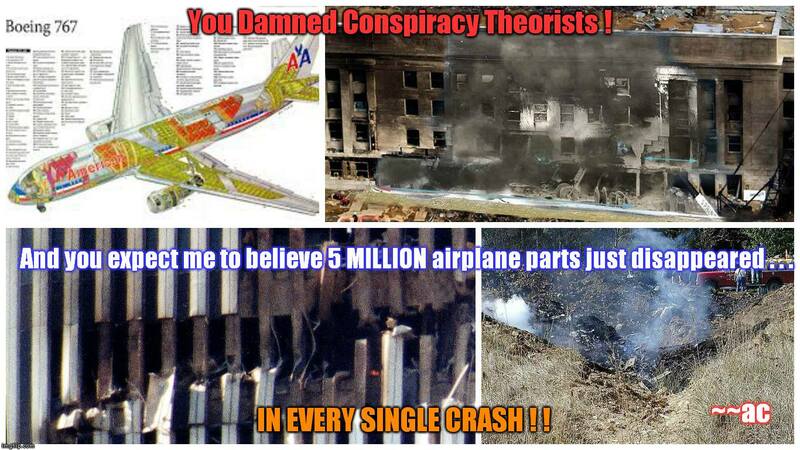 If flights AA 11 and AA 77 never existed, then there are only two planes, not four, to be accounted for. Investigators who have checked the tail numbers for the planes which departed as UA 93 and UA 175 on 9/11 (namely N591UA and N612UA respectively) believe that these planes are still in service. 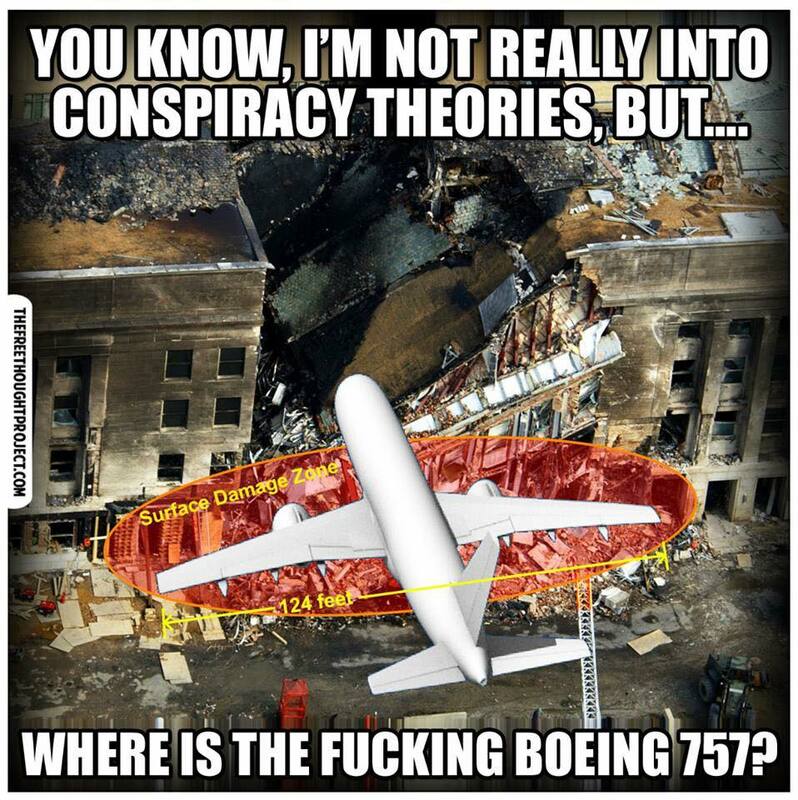 If so, and if AA 11 and AA 77 never existed, then the number of Boeing 757s and 767s destroyed on 9/11 was not four, as the US government maintains, but rather zero. Both UA 175, plane number N612UA and UA 93, plane number N591UA, were “still registered and valid more than 4 years after [their] alleged destruction. The two United Airlines flights were not deregistered until October 2005, as of official FAA records. Both should have been listed, by law, as ‘destroyed’. Shortly thereafter, the FAA rectified this ‘oversight’ in a peculiar manner : in place of ‘destroyed’, the wording used was ‘cancelled’. 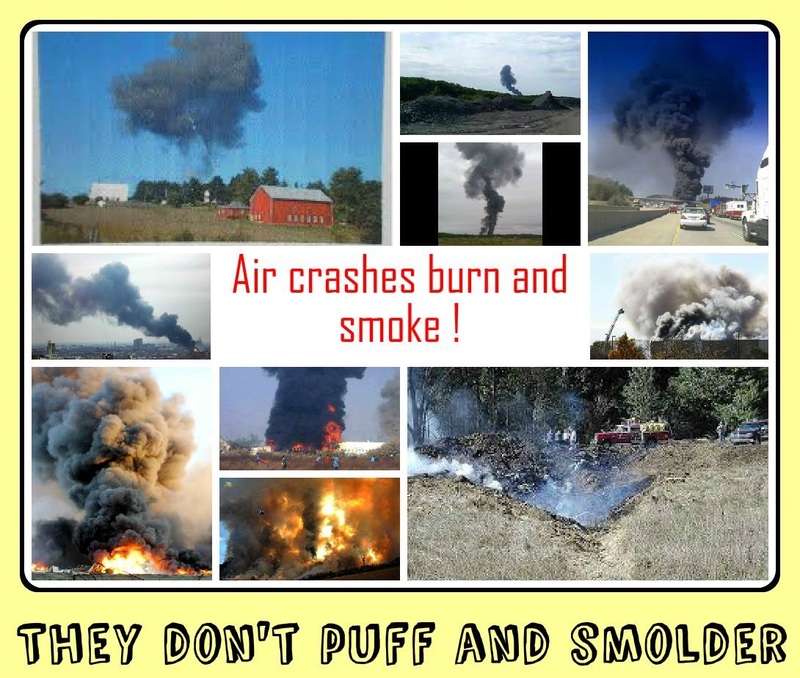 This evidence has not been challenged, to this day, by any of those air-regulating agencies nor by the airlines themselves. Pilots For 9/11 Truth, have confirmed that United 175 received a message at least twenty minutes after it allegedly crashed into the World Trade Center. 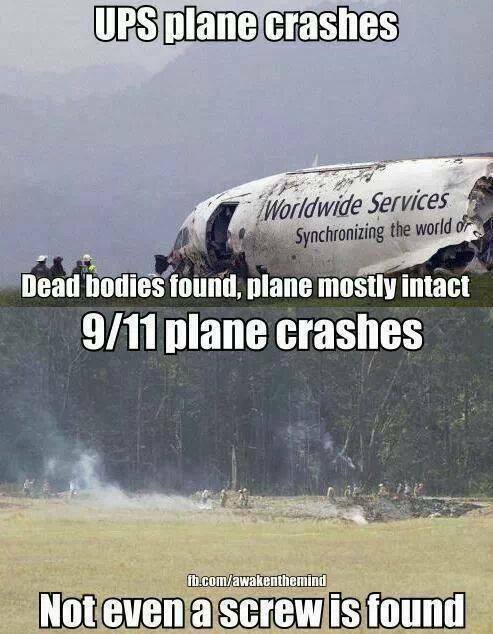 This proves that the flight never smashed into the Center but instead flew for some time that day, a point advanced in the book ‘Planes Without Passengers: The Faked Hijackings of 9/11‘. 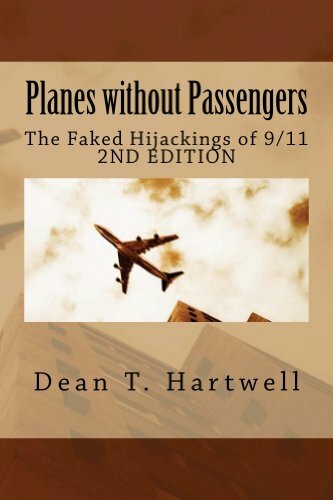 In the second edition of ‘Planes Without Passengers: The Faked Hijackings of 9/11’ Dean T. Hartwell confirms the conclusion of the first book that no hijackings took place that day and puts together a more complete theory: Only two planes of the four planes alleged to be connected with the 9/11 plot actually flew on that day. And the passengers were not people who paid a ticket to go from one place to another. They were instead agents connected to the plot who were chosen to help cover up the crime. This theory is based primarily upon two facts: (1) the Bureau of Transportation Statistics (BTS), which maintains information on all commercial flights in the United States, in its original form stated clearly that while United 175 and United 93 were scheduled and flew, American 11 and American 77 did not and (2) ACARS, a system much like electronic mail and GPS, shows that United 175 and United 93 were flying over the Midwestern part of the United States long after their supposed “crashes” on the east coast. Agents pretending to be passengers were seen at the Cleveland Hopkins Airport late that morning. They walked toward a NASA building to make calls to the media to straighten out an impression many had that the Internet reported that United 93 had landed in Cleveland. History should not be a lie agreed upon by the media, the politicians and others of influence. History must give us the most likely events based on the available information. This book aims to be a part of history we may not want to believe, but we should believe because it weighs the facts in an objective manner. The Alleged Passengers – What Happened to Them? Did They Even Exist? Of a total 760 seats there were only 198 passengers, on the 4 alleged flights. 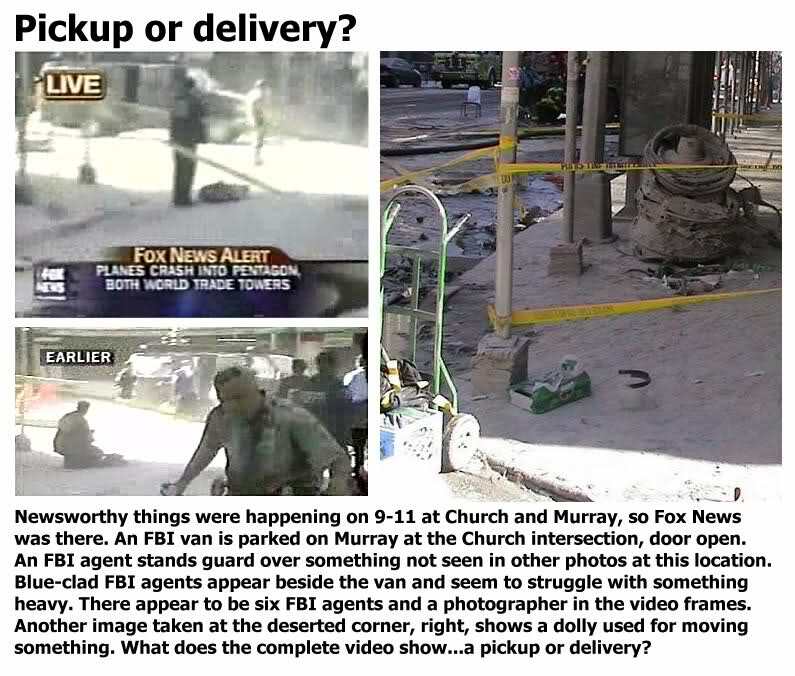 As the number of strange anomalies and coincidences on the morning of 9/11 pile on top of each other, a reasonable investigator would at some point start to use the sheer force of so many convenient improbabilities against the official narrative. 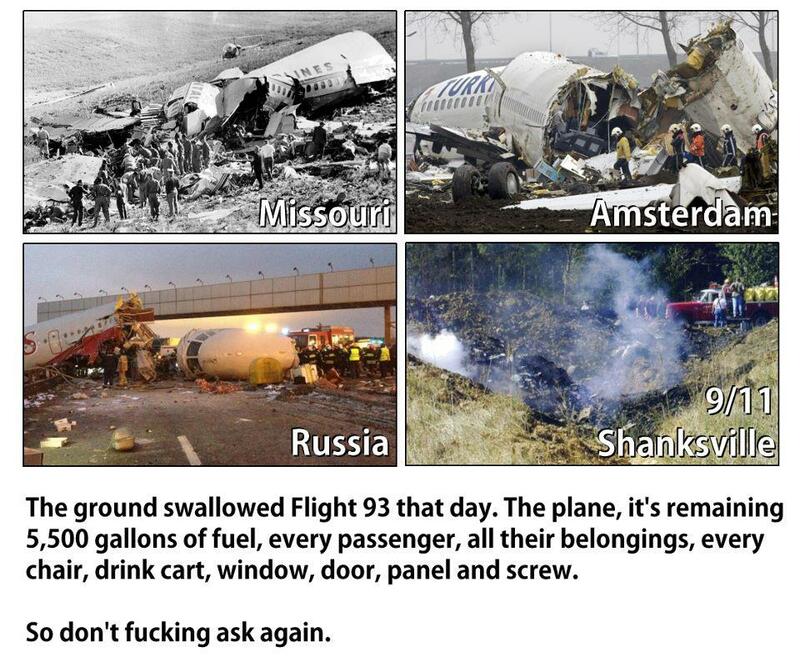 Add to that pile of suspicion the unusually low number of passengers aboard each of the hijacked flights that morning. Flight 11 and Flight 175, both Boeing 767s with approximately 180 available seats, had 76 and 46 passengers respectively. Flight 77 and Flight 93, both Boeing 757s with approximately 200 available seats, had 50 and 26 passengers respectively. What this 30% passenger occupancy essentially means is that on each of the flights that were hijacked that morning, every passenger on every plane had an entire row to themselves to lie down. Any savvy, experienced traveler knows that when flying a major airliner, on a non-stop cross-country trip, at a commuter friendly morning flight time from one major U.S. city to another, it is incredibly good luck to get a row of surrounding open seats. On the morning of 9/11, every passenger on every plane had, essentially, an open row to themselves. And on Flight 93 that went down in Shanksville, PA, there were 10 more rows than passengers. 9/11 investigators have attempted to compare these numbers to the passenger lists from the same previous Tuesday morning flights the week before, on 9/4/01. But the FBI continues to refuse, without any explanation, to produce that information. It is known, however, that major airliners in the U.S. regularly shift their passengers to other flights and airlines serving the same cities if numbers are too low to justify the flight. But on the morning of 9/11, this protocol, like so many others that day, was not followed. Furthermore, on the morning of 9/11 on officially released passenger lists provided by the airlines to the media, not one of the alleged hijacker’s names appears. In fact, no Arab names appear on any of the four passenger lists. “It has been claimed that the names of the hijackers were on the airlines’ flight manifests. However, there is no public evidence of this. Researchers who have attempted to obtain this information from the airlines have been rebuffed.” Add this information to the stories that have been told of last minute gate changes, passenger swaps, bizarre cell phone calls, planes disappearing and reappearing on radar screens, impossibly flown aircraft maneuvers, and you would have at least a part of a story worth investigating. But the oddly low numbers of passengers on the planes that morning, and the complete absence of any of the alleged hijackers’ names on the original flight passenger lists, is left as irrelevant. Why? What could possibly be more relevant than the fact that the main suspects of the crimes in question appear not to have even been present at the scene of those crimes? The plot by America’s military bosses was devilish in both design and intent – to fabricate an outrage against innocent civilians, fool the world and provide a pretext for war. In the pentagon, a top secret team drew up a plan to simultaneously send up two airliners painted and numbered exactly the same, one from a civil airport in America, the other from a secret military airbase nearby. The one from the airport would have military personnel on board who had checked in as ordinary passengers under false names. The one from the airbase would be an empty drone, a remote-controlled unmanned aircraft. Somewhere along their joint flight paths, the passenger-carrying plane would drop below radar height, and disappear, landing back at the airbase and unloading its occupants in secret. Meanwhile, the drone would have taken up the other plane’s designated course. High over the island of Cuba, it would be exploded in mid-air after broadcasting an international distress call that it was under attack from enemy fighters. The world would be told that a plane load of blameless American holidaymakers had been deliberately shot down by Fidel Castro’s Communists – and that the US had no choice but to declare war and topple his regime. The passenger manifests have been changed multiple times, there is no CCTV of passengers or hijackers, no testimonies of people working the airports that day, no boarding cards or DNA analysis. Three planes were scheduled to fly to Los Angeles, arriving around the same time. No sign of Flight 175, Flight 11, or Flight 77 passenger pickups or victims families at Los Angeles Airport at scheduled arrival time. No media sightings of waiting victims families and worried friends, eager for information, as we would expect from three commercial plane crashes. Where were the grieving families at the airports? I don’t recall seeing frantic loved ones at the airports looking to find out where their family members were. In all these years I haven’t seen one documentary provide anything in video footage of families at airports talking to the media. 1). Did you take someone that day to the airport and watch them board one of these flights and see the plane take off with that person on? 2). Can you show proof of a real manifest for any of these flights (signed by the pilot)? 3). Can you show any other proof there were any passengers on these flights? Researcher Elias Davidsson demonstrates in his recent book Hijacking America’s Mind on 9/11: Counterfeiting Evidence, there is not one shred of authenticated evidence that any of the 19 men blamed for the “attacks” ever boarded any planes. What about the phone calls from the passengers? The technology that existed in 2001 made it impossible for the cell phone calls from the nine passengers the FBI has records of having been made, to have been made from their hijacked jetliners in flight. This and the lack of background noise during the calls indicate that the calls were not made while in flight. t wasn’t until 2004 that technology was being developed to enable fairly reliable cell phone calls from commercial jetliners. “Gentlemen! We have called you together to inform you that we are going to overthrow the United States government.” So begins a statement being delivered by Gen. Carl W. Steiner, former Commander-in-chief, U.S. Special Operations Command. But it is not Steiner. It is the result of voice “morphing” technology developed at the Los Alamos National Laboratory in New Mexico. By taking just a 10-minute digital recording of Steiner’s voice, scientist George Papcun is able, in near real time, to clone speech patterns and develop an accurate facsimile. Steiner was so impressed, he asked for a copy of the tape. My latest book, Rumors Fly, Truth Walks: How Lies Become Our History, concludes that there were no passengers on any of the flights said to have been involved: American 11, American 77, United 93 and United 175. I want to take this idea one step further. With no passengers involved, how did the names that appeared on passenger lists get created? Officially, the people on these lists were dead. One would ordinarily expect the names of deceased to be reported by a mortuary or by family members to an official source such as the Social Security. But because the “passengers” bodies were never recovered, there is no reason to believe a mortuary would report their deaths. That leaves family members. But how did family members “learn” of their losses? The media. How did the media decide to accept the names they published on the lists of passenger victims? I have decided to focus on Flight 11. The Boston Globe posted Flight 11 passenger list on September 13, 2001. I find no information on how the Boston Globe got the passenger list for Flight 11. The only logical sources would be American Airlines or the Federal Bureau of Investigation. Airlines have the names of their passengers because the passengers must give this information upon buying a ticket. In the event of a disaster, it would make sense for the airline to release the names of those from its official record (the manifest) so as to notify the public. But they apparently did not release the names here or serve as the source for the Globe. The FBI took over the investigation of the “plane crashes” from the group that has the responsibility to investigate them, the National Transportation Safety Board. How did the FBI know so quickly that the plane crashes had been acts of terrorism? From fake phone calls or other staged “evidence” that the media ran? How would the FBI have obtained the passenger names so quickly? Ordinarily, again, one would look to the airlines. But they are not the source. So who created the list? A look at the list helps us to answer this question. In my research of “passengers” on the Flight 11 list in late 2013, I discovered that only 24 of the 81 “passengers” on board Flight 11 appear on the Social Security Data Index. [Rumors Fly, Truth Walks pages 99-101]. I ran across an article by “brianv” on “Let’s Roll Forums” in which the author said in 2005 that he discovered only 9 of those same 81 “passengers” were on databases that serve as “front ends” to Death Records, Public Records, SSA Master Death File Database. Allowing that there might be some discrepancies between the two sources, I used his method of checking on names on May 4, 2014: “I start with a wide open search on the Name only at http://www.stevemorse.org/ssdi/ssdi.html this returns the SSN of the person, if that person existed. I then cross reference with the other web – http://knowx.com/death/search.jsp. 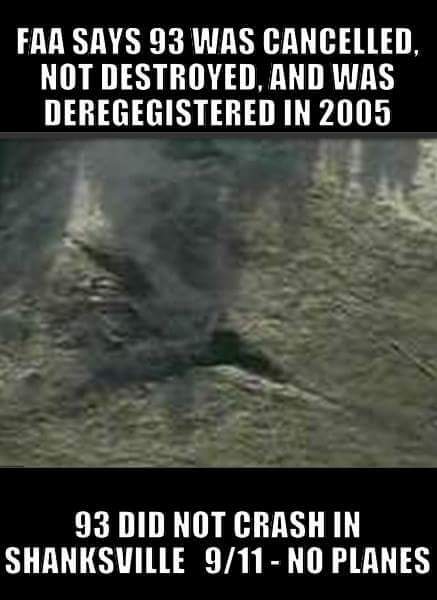 I found people accounted for that he said did not show up in 2005! Why would death records change for people already dead? I keep coming back to the question: Who created the list? What is the list composed of? What about SSDI searches before 2005? Were there even fewer names then that showed up on SSDI? Here is what we know: the flight list got to the media (namely, the Boston Globe) very quickly. The allegation of a plane crash took place on the morning of September 11, 2001. The newspaper published the list on September 13. The party that had the responsibility of maintaining the list of passengers was American Airlines. The airlines is the only party that could have the official passenger list, known as the manifest. The Boston Globe does not identify American Airlines as the source of the list. In short, we have an unofficial list that could have been created by anyone. Someone composed a list of 81 names that would be known as Flight 11 passengers. They chose some names of real people, the people who show up on the SSDI lists. The earlier the research of SSDI lists, the more likely the true number of real people who actually died on 9/11. There was likely enough time for plotters to find names of recently deceased individuals and add them to the list. There were nine such people on “brianv”’s list. Many of them were elderly, giving rise to the possibility that names were taken from retirement homes. The rest of the names are most likely fictitious. Dean Hartwell – Planes Without Passengers Challenge: What Happened To The Passengers? In short, the stories of plane hijackings and the use of the planes by hijackers to strike buildings was a complete hoax. So, too, were stories of distressed passenger calls from planes. The more I researched and debated this matter, furthermore, the more it appeared that, with some exceptions, the alleged passengers were manufactured or used identities. This analysis led to my books Planes without Passengers: the Faked Hijackings of 9/11,1st and 2nd editions. These books form the basis of what I say in this essay in which I give my best hypothesis as to the identity of the passengers and what happened to them. Did they go to the airport/to the gate of flight? – There is no mention of anyone saying publicly that they went with an alleged passenger to the airport or the gate in the official report. Did the alleged flights take off? – The Bureau of Transportation Statistics says no for Flights 11 and 77. 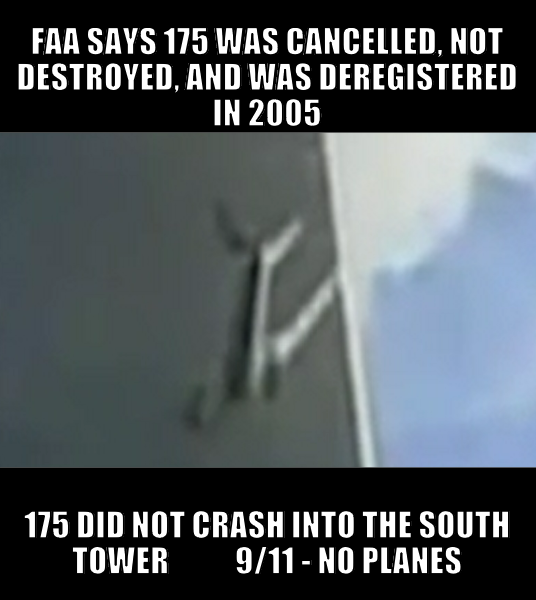 The same source says that Flights 175 and 93 did. Where did the flights land? – I don’t know – ACARS records (similar to email but for use for control towers and airplanes in flight) say 93 and 175 flew west of New Yorkhours AFTER they allegedly crashed in Pennsylvania and the World Trade Center,respectively. Read the book to see why I think Ohio is the most likely landing place. Did the passengers exist? The assertion of their existence is not provable or disprovable. With a number of “passengers” from Flights 11 and 77 not passengers on those flights, and probably not passengers at all, it is clear that at least some of the identities are manufactured. Researcher Richard D Hall has “mapped” as many of the flight 175 plane crash videos as he could onto/into a 3D-model of Manhattan. 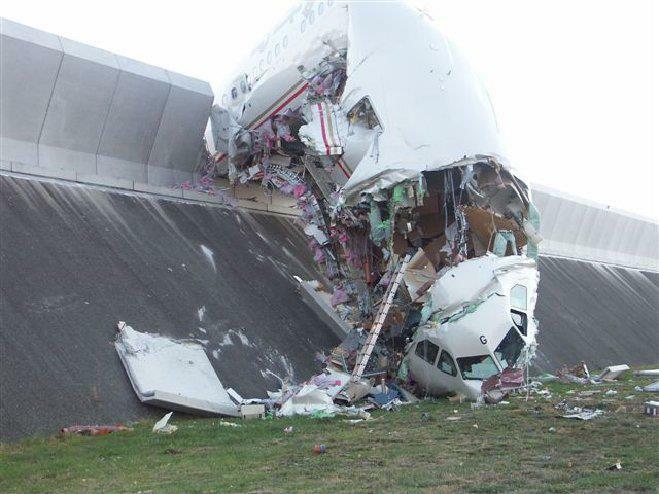 This analysis was published on 21 May 2012 and revealed that 26 clips of the flight 175 crash did indeed appear to match the Radar Data supplied by the NTSB (but there was a discrepancy of about 1400 feet/430 metres with the 84 RADES Radar Data). This tended to rule out the idea of “simple video fakery” – which is what most other “no planers” argue. It seemed to bring us to the point of realisation that “another” technology had been used – one which created the image of planes in the sky – which really could be filmed/video’d. This also explains one of the fundamental difficulties with the “only video fakery” position – some witnesses did report seeing a plane – though there were sufficient variations in their accounts to suggest that there could have been issues with viewing the projected image from certain locations. One of the curious things is the “disappearing wings” observed in some clips – this should not happen with CGI! Note: since this video has been circulating a possible explanation for the difference in the two flight paths (Daniel R. Bower & RADES) has been suggested. The RADES radar system was much further away from the towers, the distance is significant enough to create a fixed system error in the radar readings. This could account for why the RADES path seems over 1000 feet out of position. However, all the other observations in this film are still unexplained. I.E. The speed and impact dynamics are both impossible, therefore we were not seeing a plane in any of the videos. My current thinking on this is there may have been a solid object, probably a small missile at the centre of the “illusion”, with an image of a Boeing 767 being projected around it. The speed recorded is consistent with several types of missile in use in 2001, one being the Tomahawk missile. The size, speed and range of the Tomahawk all match the observed circumstances, they can be launched from a submarine. The speed is definitely not consistent with a Boeing 767. An energy weapon may have been used to created the “wing holes” shortly after impact as was seen in the first tower impact. 13. 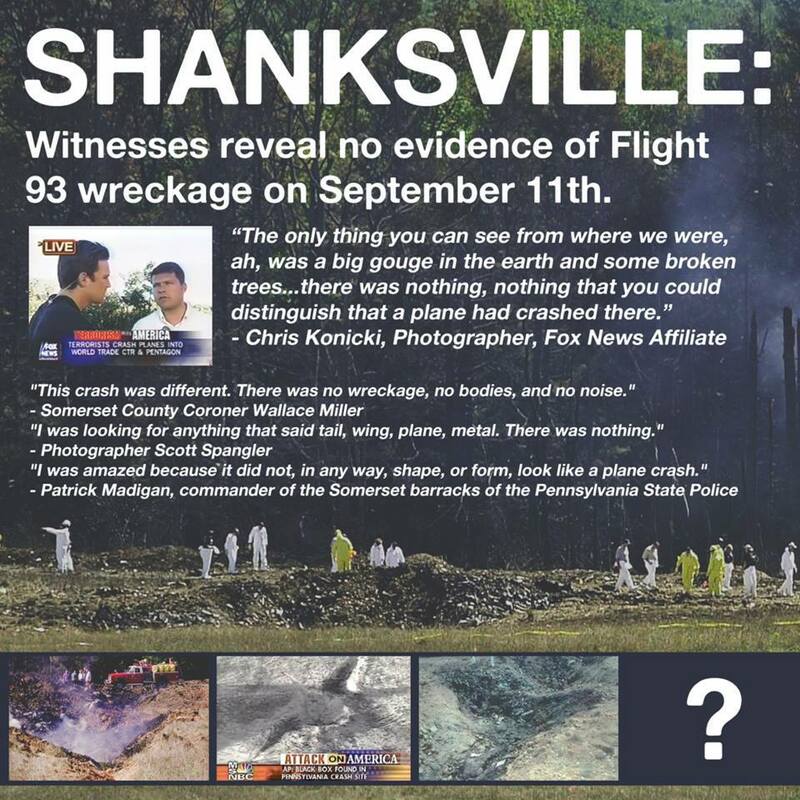 Most people in the 9/11 Truth community accept that no planes were used at the Pentagon and Shanksville; the evidence shows no real planes were used for the towers either. 15. 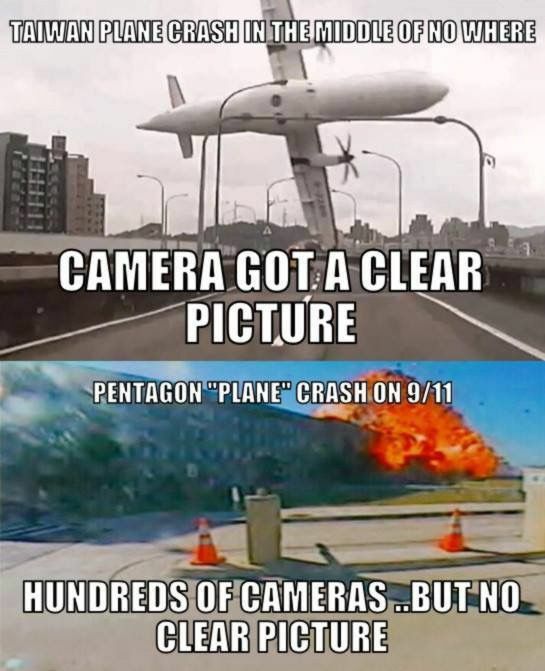 In conclusion we can be 100% certain the planes were not real. 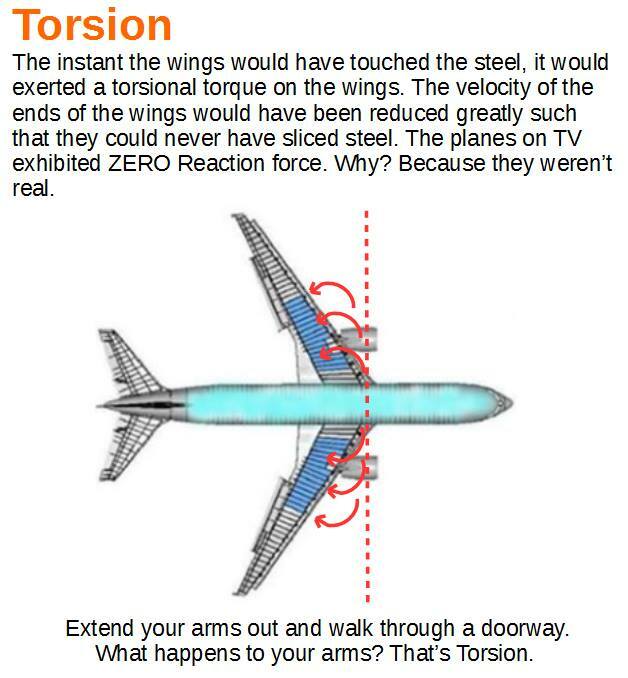 Apart from defying the laws of physics with impossible crash dynamics the planes do not even look real. The question is: are the planes digital composites (CGI) inserted into real video or is it a 3D projected image using advanced technology not known to the public? Richard D Hall’s 3D radar data analysis has confirmed that the trajectory of the “planes” in all the videos match up with the radar data. If video fakery was used i.e the planes were digital composites, the question can be asked why would they go to the trouble of making sure all the “plane” videos match up with the radar data but do such a poor job of rendering the planes which look like poor quality CGI, Why does the wing momentarily disappear in six different videos? This still from the Hezarkhani video shows a digital composite plane on the top and the original “plane” from the Hezarkhani video underneath. The digital composite plane looks more realistic. Here is a video showing how easy it is to create a digital composite plane and insert it into real video: https://www.youtube.com/watch?v=Rml2TL5N8ds Here is another example of a digital composite plane inserted into the Evan Fairbanks video. Why would they create such poor quality CGI planes that look different in different videos? If the planes were a digital composite it should look the same in every video. Based on Richard D Hall’s radar data analysis (http://www.youtube.com/watch?v=b5DgFcpsxes), the witness testimony and the fact the left wing disappears in 4 videos the evidence points to the plane being a 3D projection. Richard D Hall believes there may have been a solid object, probably a small missile at the centre of the “illusion”, with an image of a Boeing 767 being projected around it. In 2012 Richard carried out analysis of 9/11 radar and video evidence of flight 175 as it appeared to impact on the world trade centres South Tower. The analysis showed that 26 separate recordings of this event showed a consistent aeroplane path. Video and radar data showed that the object was travelling at around 580 miles per hour. Most pilots agree that 580 miles per hour is an impossible speed for a 767 travelling near sea level. Not only that, close up videos showing the alleged plane impacting on the side of the tower show completely impossible impact dynamics. 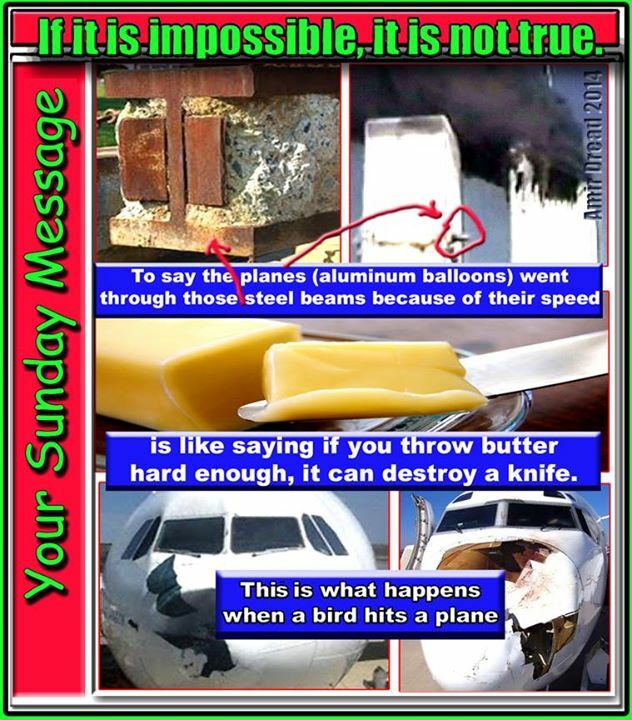 Very little deceleration is seen on “impact”, no plane debris break off and the whole plane is seen to be enveloped into solid steel columns. So with two major impossibilities the question arises, what was actually used? We know whatever it was cannot have been a 767 due to the impossible speed, so why did it appear to be the shape of a 767? 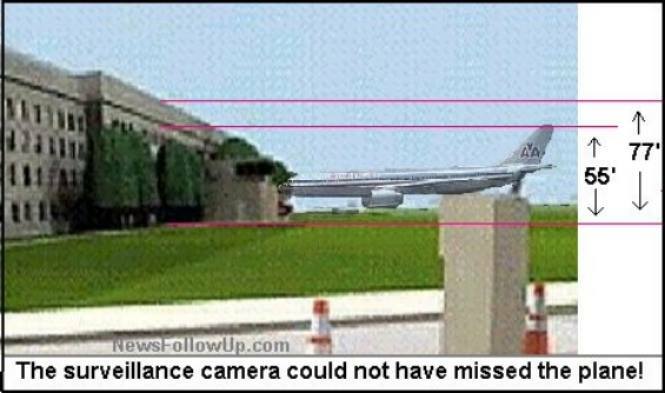 By studying the video evidence closely it suggests that some kind of illusion was being generated to trick observers of the existence of a 767 aircraft. It is possible that a solid object was cloaked inside the illusion. If the military carried out this event, then it is a reasonable assumption that a missile may have been used at the centre of the illusion to create the explosion. John Lear explains just how impossible the speed was, which is a piece of glaring evidence that is not going to go away. Donald Trump recognizing the impossibility of a plane passing through thick steel and concrete on 9/11. This entry was posted in Uncategorized and tagged 9/11, 9/11 Cartoon Physics, 9/11 Conspiracy, 9/11 Crash Test, 9/11 Drone, 9/11 Hijackings, 9/11 Impossible Physics, 9/11 Inside Job, 9/11 Media Complicity, 9/11 No Planes, 9/11 Plane Fakery, 9/11 Remote Control, 9/11 Truth, American Airlines Flight 77, Andrew Johnson, Dean Hartwell, Dr. Judy Wood, Dr. Morgan Reynolds, Gerard Holmgren, John Lear, John Lear Affidavit, Pilots For 9/11 Truth, Richard D Hall, September 11 Attacks, United Airlines Flight 11, United Airlines Flight 175, United Airlines Flight 93, Word Trade Center on January 11, 2014 by 911planeshoax. Excellent post – well done for compiling it all. 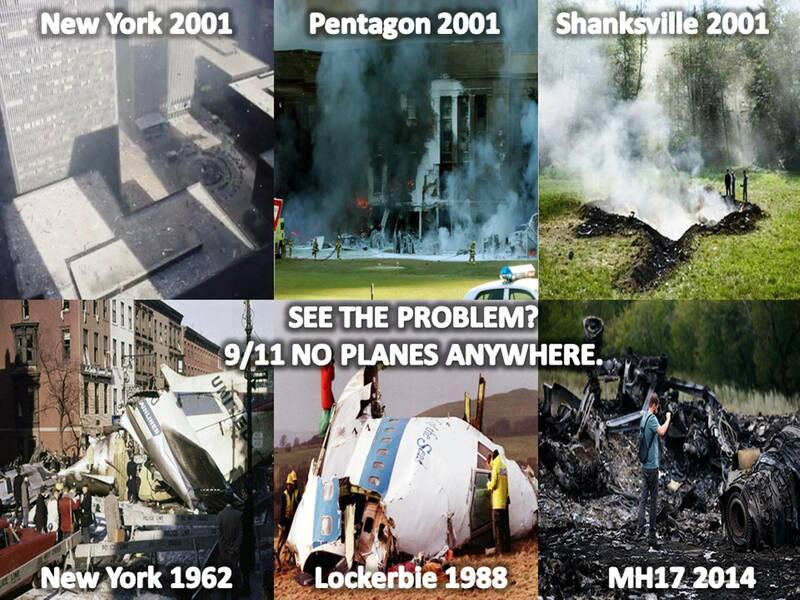 Pingback: 911 Scientific Proof No Planes… : What Happening? Very thorough and well done. Right on the momey as I see it. Thank you for your post, good job. That deserves a Nobel Peace Prize. Many thanks for your heroic effort. Makes PERFECT sense …. 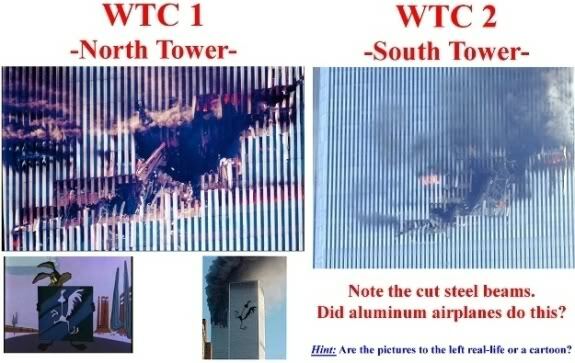 cause the flash of ‘Light’ you see in the close-up of the plane entering the WTC is the Holograph (light) of a plane disappearing into the building. NO PLANES is right …. just an image (holograph) of a plane literally disappearing into steel ! I don’t understand the need to go through this again. Every sane person knows that the fuselage of a plane crumbles against a solid object. (It’s not because I’m ex RAF). It does not pierce a building. The firemen know the truth. The news editors know the truth. They just cannot say. I’m glad I’m not from the USA when it comes to this episode. Time for trial by TREASON for Poppy, Dubya, Cheney, Rummy, PNAC Attackers, et al for their 11/22/63 and 9/11/01 Coups upon OUR Country! Excellent compilation of proof that there were no physical planes used. It has all the arguments and more to convince those who just want to believe they were not lied to. Great job. I hope one day enough people agree and we heal from this humongous lie. A very analytic post well done, it’s undisputable! Organised conspiracy right in the face. An object of less density and less mass can never penetrate an object of greater density and greater mass regardless of speed. Just the exterior columns in the area supposedly struck have more mass than the plane. The 8 concrete floors in the affected area had at least fifty times the mass of the plane. The columns were spaced at one meter on center, literally an impenetrable colonnade. I like the simplicity of your comments! Thanks! I always thought of the vertical edgewise columns as a potato french fry cutter to the planes…I had never thought about the massively thick HORIZONTAL concrete and steel FLOORS! How stupid of anyone to think a plane could do the damage seen. What’s the most important thing about the destruction of the World Trade Center? What’s the most important thing that had to happen, if you were the perpetrator?? Of course, the answer is that the buildings had to collapse. That’s where the real drama was….in collapsing buildings. However, it wasn’t enough to just plant explosives in the buildings. Airplanes were needed as an excuse for the buildings to collapse. And they couldn’t miss. That was not a risk they could take, whether the planes were re-enforced, flown by expert pilots, remotely guided or whatnot. 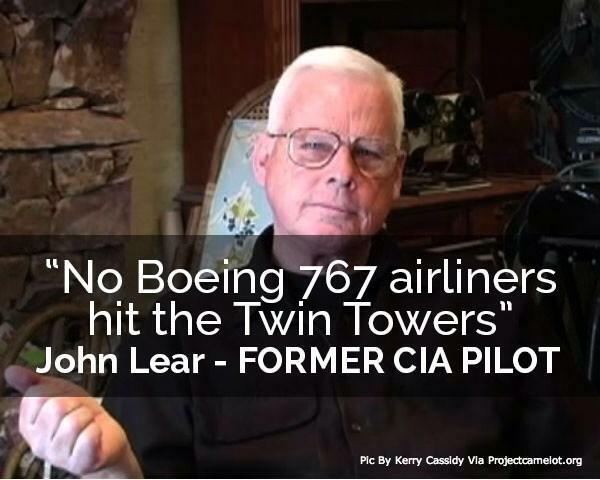 To use real planes would have been an enormous risk. 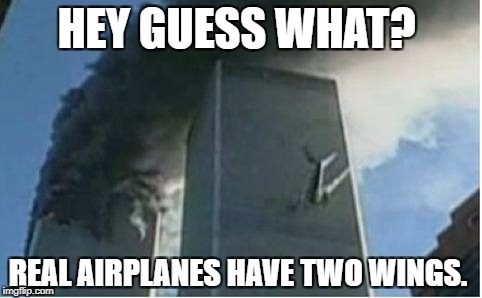 First, the planes could miss the buildings. Second, they could hit in the wrong place. Third, their impact could not be impressive enough to destroy the buildings. All those factors would be unacceptable risks. The only way to be certain the impact looked believable was to fake it, Hollywood style, with advanced computer graphics. There were no planes. The buildings exploded from the inside, as numerous people have testified. 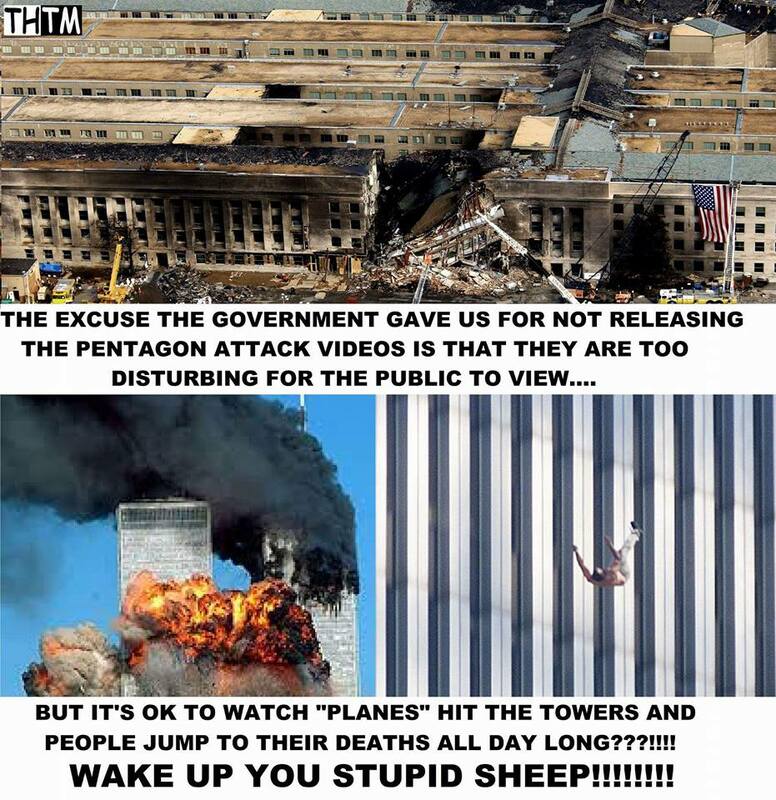 The only people who saw planes were watching television. It is “common sense” to assume that thousands…if not millions of people saw planes. So common, in fact, that most people will not question it. After all, it was on TV wasn’t it? Despite the testimony of thousands of architects, engineers, airline pilots, and other experts about the physical impossibility of there being real planes, the TV show has trumped them. Despite the lack of physical evidence of planes (the engine they found was from a wrong plane), the TV show has trumped them. It must be real if they saw it on TV. That’s not true. Some years ago, I put out a call for eyewitnesses who were willing to swear they saw a plane. Not one person has responded yet. They should be standing line if they were certain…and willing to swear…that they saw a plane. But all those assumed witnesses don’t exist. What’s happening here is the manipulation of mass psychology. Imagine you are standing in Hoboken, New Jersey, that day, watching WTC Tower 1 burn. Lots of people are watching with you. Suddenly, Tower 2 explodes. Some people in the crowd immediately start yelling about a plane hitting the building. But you didn’t see it. Nearby residents and businesses say they saw a plane hit the tower on TV. What are you going to do? Are you going to tell everyone you didn’t see a plane? You don’t know that nobody else didn’t see a plane either, so you keep your mouth shut. After all, it’s on TV. You just didn’t see it, you tell yourself. In fact, you may feel stupid for not seeing it. Why advertise your stupidity? There’s even a strong temptation to lie about it, isn’t there? After all, you had a front row seat on a major historical event and you didn’t see it. What will your family and friends think if you didn’t see it? Why the big push-back from the system on the no-planes evidence? Because it identifies the main players in the tragedy…the Jewish controlled media. Israel. They are also the only ones who had anything to gain from this slaughter. Had the hole been caused by internal explosions, the columns would have been blown out instead of pushed in and the debris would not have been unidirectional. Also, it is doubtful that an internal explosion high up in building would move the needle much on a Seismograph. This sounds very familiar to the moon landing. With the flag fluttering in a zero atmosphere the shadow of the astronauts in the incorrect position in relation to the sun.Was all of this filmed in studio? Arthur Conan Doyle had Sherlock Holmes make the obvious but profound statement “When you remove the impossible, what remains, no matter how improbable, must be the truth”. It is impossible for airplanes to fly through the side of steel and concrete buildings without slowing down, crumpling or breaking. Therefore the image we all saw was fake. There were no planes! Eventually this will become common knowledge, that’s when the rats will start to leave the sinking ship and we will begin to find out how it was done. very good presentation of common sense…thanks! Really makes you think! It’s too bad we always have that doubt in the back of our minds whether to believe our government. Yeah, where did the passengers go? I mean the explanation is spot on, but where did the actual passengers go? It seems that the passengers never existed in reality. They are vicsims – virtual/simulated victims. The voices from the alleged phone calls were created using voice “morphing” software developed at the Los Alamos National Laboratory in New Mexico. Software now readily available. I thought of something while going through this. 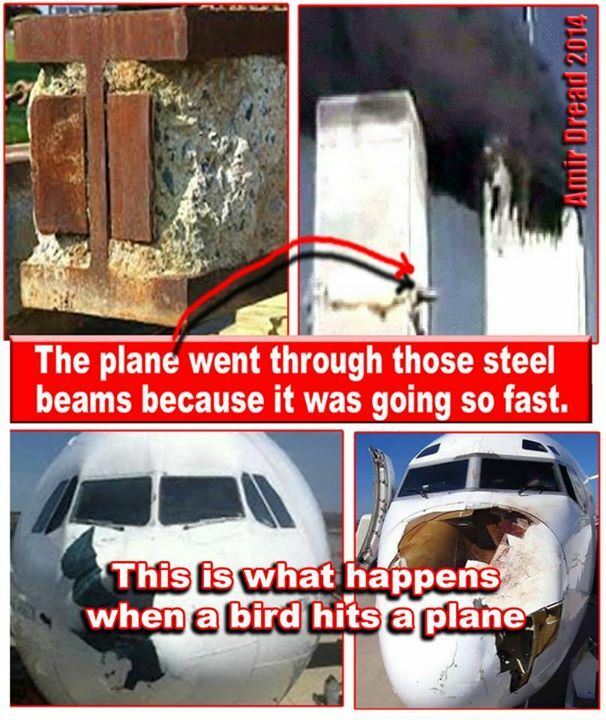 According to the photos that show a fiery explosion at the immediate impact of the tip of the nose of the plane on the WTC; according to this evidence, what would have happened to the nose of the plane which a bird hit? Apparently there is and there is also not something in the noses of airplanes at the exact same paradoxical time that would and would not explode on impact. Bird: no explosion; WTC: explosion. BTW I volunteered active duty army in October of 2002 because of 9/11 and served a year in Iraq in 2003. My mind has been changed and made up about this and I pray the fabricators of the attack on my country are one day brought to justice. It is 2018, and I am still waiting. Just discovered this article and I’m an expert. Well done. The missile that penetrated the Pentagon only went through two walls, not six. There are no exterior walls between the E Ring and the C Ring on the first and second floors.